A DOG travelled 113 miles on a train and even managed to change stations by itself as an appeal has been launched to find his owners. 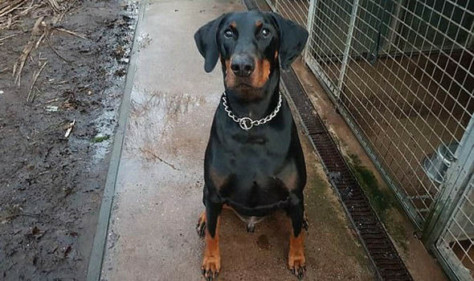 The Doberman was taken in after he was found wandering around Birmingham New Street station on his own. Believing he was a stray, the volunteers took him on a trip to the vets only to discover he had been microchipped, tracing him back to Huddersfield – a three-hour journey. But the chip had no contact number for the canine’s owners, so the now-homeless pooch has been taken in by Hilbrae Kennels in Telford, Shropshire. Volunteers at the kennels believe the clever dog must have somehow managed to swap trains at Manchester Piccadilly, which link Birmingham New Street with Huddersfield. osting on their Facebook page, the Hilbrae Kennels said: “Unfortunately there is no phone number on the chip. We have informed everyone we can think of and now we are turning to Facebook to trace his owners. The kennel owner confirmed they had written to the practice the hound was registered to but were still waiting for a response. The unnamed animal is described as a medium build Doberman, with a black coat and red markings. He was found wearing a silver chained collar, however it does not detail any address or name for the missing mutt. Anyone who recognises him is urged to contact the kennels on 01952 541254. Animal-lovers were keen to assist in the appeal, with more than 13,000 people sharing the post on Facebook.